Ohio's State Flag which features a swallow tail design was adopted in 1902. Designed by John Eisemann, the large blue triangle represents Ohio's hills and valleys while the stripes represent roads and waterways. The 13 stars arranged about the circle represent the original states of the union; the 4 stars added to the peak of the triangle symbolize that Ohio was the 17th state admitted to the union. The white circle with its red center stands for "O" in Ohio and also suggests Ohio's famous nickname, "The Buckeye State.". Tuff Flags has Ohio state flags in all standard sizes and in two fabric choices of Denier Nylon and 2 Ply Polyester. Made 100% in USA, these commercial grade flags enjoy 6 months guarantee on construction. 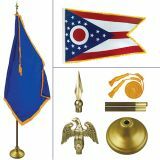 Finished with grommets and heading and reinforced with lock stitching, these flags are designed to last long and look great.Shop from our complete line of Ohio Flags right away and avail the best prices, quick shipping and much more! 100% customer satisfaction guaranteed! Show your state pride with our Ohio Flags that are made to the exact specifications and to the highest standards. Choose from popular sizes 3’x5’,4’x6’,5’x8’,6’x10’and 8’x12’ and different flag models including indoor, outdoor flags to suit your flag display needs. You can even choose our indoor flag kit that comes with everything you may need to set up a flag display including ornaments, tassels and poles. 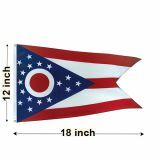 Ohio State Flags from Tuff Flags make perfect gifts, collectibles and flag display items. Drape it over the walls, fly it as garden flag or set up an elegant flag display indoors. No matter what your flag display needs are, we have something special for everyone. Shop from our complete line of Ohio Flags or should you need any assistance, call our toll free number (888) 287-3524 or email at customercare@tuffflags.com and we will be happy to assist you.